ABOUT THE QUILT: I made these matching double-bed sized quilts for friends Reiko and Makoto Hiratsuka to thank them for having my daughter Alysson to stay in Tokyo for three months. They chose the colors to match the curtains in their bedroom, and I used Moda Marbles to give a soft effect. Collection of Makoto and Reiko Hiratsuka. ABOUT THE QUILT: I made silk papers in a workshop and wanted to feature them on a quilt. After piecing, but before quilting, I inserted about 6 layers of colored gauze and silk between the quilt top and batting in various spots so I could slash the top and expose the fabrics later. I machine quilted the piece with intersecting parallel lines to create the feeling of a swirling storm. The silk papers were appliquéd to the quilt so they would look as if they were blowing in the wind. After quilting, I slashed the fabric to expose all the layers and added beads to some slashed areas. ABOUT THE QUILT: I am fascinated by the way fabrics interact with one another, and the way shapes can be made to float or recede simply by color choice. The traditional square is the ideal shape for experimentation with color because of its simplicity. I decided to make a triptych in three different colorways, exploring the effects and interactions of color within each one. Because of the geometric nature of the piece, I quilted the panels in a series of meandering curved lines that intersect one another. Wherever the lines intersect I have sewn a bead, so the triptych sparkles as you walk past it. ABOUT THE QUILT: This was a round robin quilt. Each person in our group made a central square and gave some ideas of how she pictured the finished quilt; some included fabrics for the others to use so that a colour scheme was maintained. We swapped work every two months, each person doing a “round”. We didn’t see our own top until one year later. Never having made a feathered star before, I decided to use this traditional block in the centre of my quilt, making it in my favourite colour: teal. The instructions to the rest were to use teal and white as the basis for making a traditional, slightly formal quilt top, and they succeeded admirably! Tricia Revest made the sawtooth border, while Paula Nadlestern turned the centre on point. Judy Hammersla spent hours on the appliquéd grapes in her border, and Rhona Neil pieced the lovely little baskets for hers. 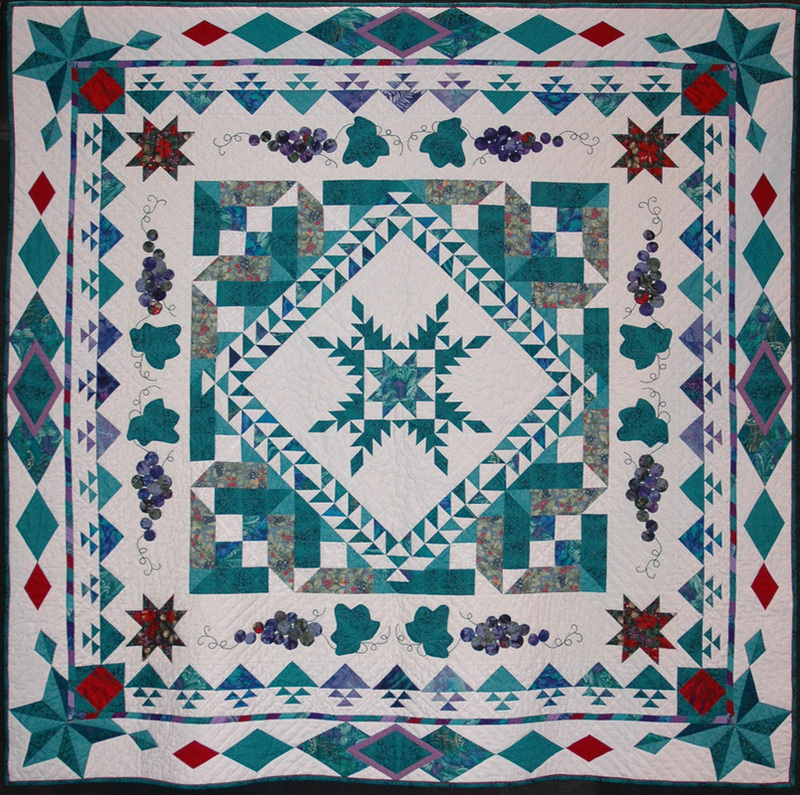 Patty Hambrick added the final border of diamonds. It took me nine years to hand quilt. ABOUT THE QUILT: This little wall hanging was an exercise in using only five fabrics of the same colour but in different shades and tones. I made the piece using the techniques I teach in my workshop (called “Building a Quilt”). 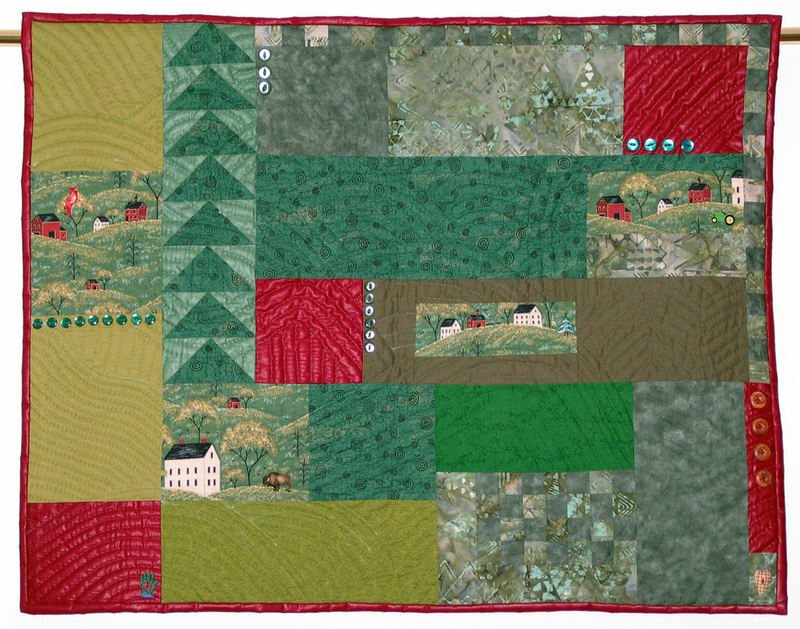 Students make the various elements of the quilt, such as the houses, log cabin blocks, checkerboard, half-square triangles, flying geese etc. and then arrange the pieces in various ways until they create a pleasing design. There is no pre-planning when making a quilt like this, and it’s lots of fun. This quilt was auctioned to raise money for my daughters’ school.